ReliAlert™ XC sets the standard for reliability and performance in the offender monitoring industry. Working in conjunction with SecureAlert’s 24/7/365 live Monitoring Center and TrackerPAL™ monitoring software, ReliAlert™XC acts as a “force multiplier,” providing extra eyes, ears and voice in the monitoring of offenders increasing productivity and offering peace of mind. Allows SecureAlert to call the offender via the ReliAlert™ XC device at any time. A unique feature on the ReliAlert™ XC device that can be activated by the SecureAlert Monitoring Center as part of a violation protocol. The siren alerts victims and the public to an offender violation, helps safely assist officers with offender recovery and improves public safety. An optional, hardened steel encased security cuff for high-risk offenders. 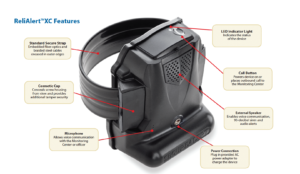 The SecureCuff™ provides valuable, extra response time for officers when offenders are attempting to abscond. When used in conjunction with live voice intervention, ReliAlert ™XC becomes the premier GPS solution for monitoring challenging offender populations.